Though often erroneously regarded as simply a variation of Calypso, Jamaican Mento is a distinct musical style that developed independently from its similarly styled Trinidadian cousin. 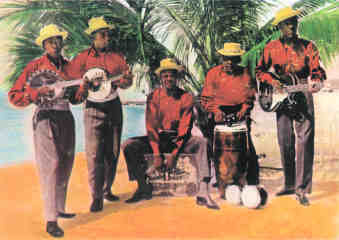 The genre remained Jamaica’s most popular form of indigenous music from the post war years up until the development of Shuffle Blues and its immediate successor, Ska, in the early sixties. The distinctive sound produced by early exponents of the style was a result of the combination of vocals, banjo, acoustic guitar, hand percussion and a rumba box, all frequently enhanced by homemade saxophone, clarinet or bamboo flute. Mento, Not Calypso! features some of the earliest recordings in the genre, dubbed directly from the original Jamaican 78s, with many featuring on CD for the first time. 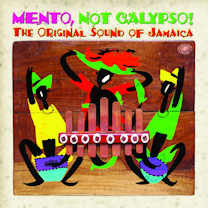 Compiled by Mento aficionado, Mike Murphy, the 2CD set is unquestionably the most definitive collection of the style yet to see issue and as such will appeal to those seeking to discover the origins of modern Jamaican music as well as the less discerning buyer simply wishing to enhance their summer barbecue! On June 27, 2014, Ivan Chin, a remarkable figure in the history of Jamaican music, passed of pneumonia at the age of 90. Chin’s Calypso Sextet is one of the most prolific and most fondly remembered mento acts of the golden age [1950s]. Chin’s was consistently a strictly rural mento band, with lead singer Alerth Bedasse’s mento voice and an instrumental line up of bamboo instruments, banjo, acoustic guitar and rumba box. The band was named for producer Ivan Chin rather than for any of it’s musicians. Ivan Chin: The band consisted of a rumba box, a bamboo saxophone, a bamboo Flute, a banjo, a guitar, a floor bass guitar with four strings, a maracas and two heavy sticks called clave, which they knock together. All the instruments were made in Jamaica with local wood, bamboo and other things. Although a handful of Chin’s tracks have appeared on compilations, most have never been compiled, and many of the original 78s are incredibly rare, even by mento standards. Most of these tracks have not been available since their initial release on 78 RPM singles in the 1950s. Many of these singles were limited to just one pressing of 400 copies, making them ultra scarce, even by mento standards. Some of these recordings were never pressed to vinyl at all, being released for the first time in any form almost 50 years after they were recorded. In 2004 Ivan Chin began to (re)issue Chin’s Calypso Sextet, personally handling all aspects of this project. Ivan even provided his personal recollections that shed more light on this seminal golden age mento and label act than has been available before. These CDs, though made by Ivan Chin, are being marketed by CD Baby. The CDs collect nearly all of the 84 released Chin’s tracks, plus some that were never released. There is not a bad song in the bunch and the music, vocals and lyrical content are nicely varied. This is hard-core rural mento. The melodies are strong and catchy and the playing is excellent, as almost all the tracks have little jams between banjo, bamboo sax and/or flute. Theodore Miller was born on August 1, 1922 in the Watson’s Hill area of Manchester, Jamaca, a rural district very close to the St. Elizabeth border. The area he grew up in was full of mento bands. Miller formed his first band in 1940 with two guitar players, his brother Alfred Miller and Allington Rhodes; the group played mainly at parties, booth, and quadrille dances. It expanded in the 1950s and included, among others, Cleveland Salmon on rumba box. In the 1960s, Mr. Miller and his band forged an important association with the Lititz community center, and through it began competing in the Popular & Mento Music competition in the National Festival for the Arts. In 1967, his Lititz Mento Band placed first in what was their first year of competition. Many competition successes followed–a bronze medal in 1969, silver medals in 1970-72 and gold again in 1973. By the mid-1970s time it had become a Festival fixture and one of Jamaica’s most in-demand mento groups. Throughout the 1980s and 1990s, it was a darling of the Jamaica Cultural Development Commission. In recognition for its work in the “Preservation of Ancestral Rhythms” (an effort Miller led), the group received a Bronze Musgrave Medal from the Institute of Jamaica in 1998. I interviewed Mr. Miller in 2002 and he took me to my first nine-night (it was in Santa Cruz). The picture above is one I took of him playing that night–it was amazing experience. I consider him one of the most important people I spoke with during my research. Like Moses Booth (Rod Dennis Mento Band) and Vincent Pryce (Blue Glaze Mento Band), Mr. Miller was from the first generation of mento band leaders to be recognized by the post-independence Jamaican government for their contributions to Jamaican culture. His passing represents a great loss. “Dance Music and Working Songs From Jamaica” by The Lititz Mento Band. This CD was released in Germany in 1993 on GEMA. Two video clips featuring Lititz fiddler Theodore Miller can be seen on the Mento Video page. This amazing CD is available on iTunes. Get it while you still can. As far as we can tell, the Jamaican fiddle tradition is no longer. Banjo plays a primary role in Jamaica’s national folk music known as mento – an indigenous fusion of the island’s African and European folk dance traditions. Other forms of music, such as Cuban rumba and Trinidadian calypso, have also been and continue to be absorbed into the mento style – and vice versa. Mento has a characteristic 3:3:2 rhythm in quadruple time with an emphasis on 4th beat in a bar of 4. The songs are usually in major keys and key changes are not common. Mento songs are secular and usually non-political in nature, however the lyrics are often humorous and surprisingly bawdy. These are sung in both standard English and Jamaican patois. 4-string banjo is the main instrument in mento. Usually this is a tenor banjo tuned in some kind of fifths tuning, although not always to concert pitch. If a tenor is not available, musicians will use a 5-string banjo and take off the 5th string – either capoed up or tuned in a “uke” tuning (essentially making it a plectrum banjo). The most common mento instruments used to accompany a banjo include guitar, maracas and a rhumba box (also known as a marimbula). Due to its volume and sharp tone, the banjo’s role in mento is both rhythm and lead. Banjo players are given “breaks” between verses to improvise arpeggio-based solos that harmonize with the primary chords and suggest the rhythm. These lead melodies often vary between eighth notes and quarter-note triplets creating a polyrhythmic banjo phrasing over the choppy upstroke of the guitar strum. One of the best and most influential mento banjo players was Moses Deans – an original member of The Jolly Boys, mento’s best known group. Moses Deans can be heard on the Jolly Boys’ excellent late 80’s to early 90’s albums Pop ‘N’ Mento, Sunshine ‘N’ Water, and Beer Joint & Tailoring. These recordings feature Allan Swymmer on lead vocals & bongo and a have a rustic, natural feel. Moses Deans passed away around 1998. Another notable mento banjoist was Nelson Chambers (October 10, 1944-November 14, 2010), co-founder of The Blue Glaze Mento Band. Nelson Chambers’ Caribbean banjo licks can be heard on Stanley Beckford’s two essential mento albums – Plays Mento and Reggaemento from 2002 and 2004. Nelson Chambers also performs on Blue Glaze’s outstanding new studio release “We Will Wait,” one of the best albums to come out in 2011 and the last recordings he would make before his death. Mento was the music of the Jamaican dancehalls before ska, rocksteady and reggae came along. A people’s music typically played in the countryside on acoustic–often homemade–instruments, it dates to the late 19th century. Its lyrics often dealt with rude or slack topics, or addressed the social issues of the day. Although often confused with calypso (largely because calling it “calypso” was a handy way of marketing it to tourists who didn’t know any better), it has a rawness and rhythmic feel that is uniquely Jamaican. In winter of 1946, Hollywood star Errol Flynn purchased Navy Island for the princely sum of US$80,000. For the next decade that small swath of land, not even 100 yards from the beaches of Port Antonio, became the berthing place for Flynn’s yacht Zaca, and the staging point for his unending parties that is today the stuff of legend. 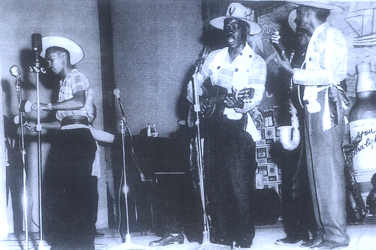 The entertainment Flynn featured most often in those days was a small local group called the Navy Island Swamp Boys which consisted of Noel Lynch on guitar, Moses Deans on banjo and “Papa” Brown on rumba box. The mentos, calypsos and rumbas they played were the perfect soundtrack for Flynn and company’s bacchanalian excesses. Check out this beautiful rendition of “Sweet and Dandy” by the Blue Glaze Mento Band. Mento music is a fusion of African and European musical traditions that began in Jamaica in the 19th century. Although widely played throughout the island for many years, it wasn’t until the early 1950s that the first mento recording appeared on a 78 RPM disc. This decade was mento’s golden age, as a variety of artists recorded mento songs in an assortment of rhythms and styles. It was the peak of mento’s creativity and popularity in Jamaica and the birth of Jamaica’s recording industry. Interviews include commentary from leading political, cultural and musical personalities. Musical performances include a panorama of existing mento bands from all across Jamaica, some of which have been playing continuously for 45 yrs. Thomas C. Dula (June 22, 1845 – May 1, 1868) was a former Confederate soldier, who was tried,convicted, and hanged for the murder of his fiancée, Laura Foster. The trial and hanging received national publicity from newspapers such as The New York Times, thus turning Dula’s story into a folk legend. A local poet named Thomas Land wrote a song about the tragedy shortly after Dula was hanged. This, combined with the widespread publicity the trial received, further cemented Dula’s place in North Carolina legend. The song written by Land is still sung today throughout North Carolina. Several recordings were made of the song in the twentieth century, with the first in 1929 by Grayson and Whitter. The most popular version was recorded by The Kingston Trio in 1958. It sold over 6 million copies, an is widely credited with starting the “folk boom” of the 60s.